The Kangaroo Kids performed live on Fox45 Baltimore’s Morning News to help promote the BMore Healthy Expo! Saturday, March 9, 2019 9 AM – 4:30 PM. Check in begins 8:40 AM. We invite all kids ages 6 and up – beginner to advanced – to learn new jump rope skills with our special guest instructors along with our nationally recognized Precision Jump Rope and Competition Teams. New this year, we are offering an adult class from 9:30 AM – 11:30 AM! For more information, view our festival flyer. To register, go to http://registration.kangarookids.org/2019SpringFestival. Hurry, early bird discounts end on 2/20. Interested in being part of our staff? Contact us at kkidsregistrar@gmail.com for application by 2/15. Anyone interested in competition Jump Rope for fun and jumpers wanting to get ready for the spring competition season. This tournament is for both Novice and Experienced jumpers. Please see our Kangaroo Kids Fall 2018 Flyer for more information about the junior, intermediate, and prep-to-perform classes that the Kangaroo Kids offer. CALLING ALL JUMPERS – SAVE THE DATE! More details and event registration coming soon! 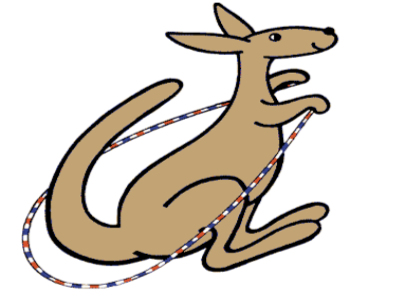 Kangaroo Kids Is Celebrating 40 Years! We invite all kids ages 6 and up to learn new jump rope skills, beginner through advanced, with our nationally recognized Precision Jump Rope and Competition Teams. Kangaroo Kids is now using an online registration process for our workshop and event registrations. First time users of the Kangaroo Kids’ registration website will need to create a user account in order to register for the Spring Festival as a Participant or Judge’s Clinic. Please create only one user account per household. All members of a family (parents and jumper) can be listed as participants in one user account. Get ready for Winter Jump Rope classes. Classes start January 9th and registration opens on December 7th! For more information see our brochure by clicking here: Kangaroo kids winter class brochure.